You can draw a textured pencil line by selecting the pencil texture, then drawing. 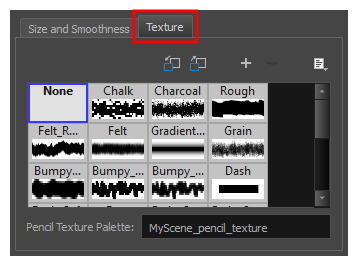 There are two ways to select a pencil texture line. You can select a pencil texture palette, then one of its pencil texture swatches in the Colour view, as you would do to select a colour, or you can select a pencil texture from the current pencil texture palette in the Pencil Properties dialog. Your pencil texture will be combined with the selected colour to make a textured colour line. NOTEYou can also draw with textured pencil lines with the Line, Rectangle and Ellipse tools. In the swatch list, select the pencil texture you want to use.